Endota spa organic rosehip oil contains certified organic rosehip which contains essential fatty acids and beta-carotene to balance and moisturise skin, vitamin C to maintain and improve softness of skin as well as tone and vitamin E, an antioxidant which also acts as an anti-inflammatory, improving the appearance of unwanted scars and blemishes. Can also be used as an intense eye contour treatment. Yep and already have! This stuff is AMAZING! My skin has seriously never looked so good. I thought because it was an oil it was cause me to break-out but it’s done the opposite.. I’ve had like one break out since I started using it (back in April). Trust me on this one girls... you need to buy some rosehip oil immediately! Where can I buy it from?? 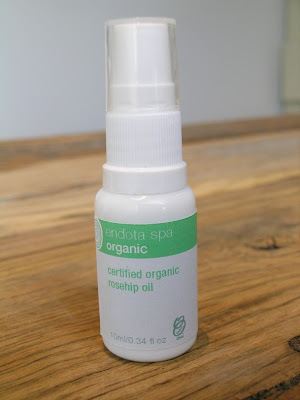 I love, love, love Rosehip Oil, I've been using it for years. I buy Kosmea certified organic from the chemist or health food stores. I love any rosehip oil it makes your face feel so soft. oh and where did you get it from hun? I definitely need to pick this up! thanks for following our blog, we really appreciate it! hahaha, loving your blog aswel, and nws on entering your competition, lush is bloody lush:) thanks for linking us too! love ur blog!!! follow me back!! This sounds amazing! Thanks for the review :) I will have to see if I can find in the US! Hi hun, I went to buy this yesterday and was sooo turned off by the smell... it smelt like cooking oil to me! So I didn't get it. Do you know if all rosehip oils smell like this?